This is my personal notes about various manipulation on videos using FFmpeg. Quite often, I use mogrify from ImageMagick and gifsicle to generate an animated GIF from a series of screen grabbed PNG images as listed below, such as in this post. I can never recall what options to use, especially for -format part. -d delays 100*100thseconds is 1 second, -o optimization level 3, -k 256 colors, and -l loop forever. In that post, I had to rotate the image for posting using convert, also from ImageMagick. With FFmpeg, it can directly output as GIF format, however, it will use dithering and that most likely wouldnt look good if you are recording a terminal window, furthermore, it will increase the file size significantly. The key point is the dither=none option of paletteuse filter, that will stop FFmpeg from trying to dither. paletteuse is only added since FFmpeg 2.6 (2015-03-06). If you need to trim out some frames, you can use the command as follows, which trims out the first frame (#0) and anything after the sixteenth (#15). There is also --rotate-180 and --rotate-270. You can also use convert from ImageMagick to do the task as seen below. -rotate takes degree in clockwise rotation, therefore -90 is counter-clockwise for 90. #0--2 selects the frames between the first frame and the second last frame, and #-1 the last frame. For frame number reference, read Frame Selections in gifsicle(1). Unfortunately, I didn't carry on after I created x11grabr. The issue I has still remained and I didn't try to resolve it very hard. Since then nothing was done, it was sort of ceased of development. When I started x11grabr, I wished I could make it like XSplit on Linux. Despite issues, my computer couldn't handle much encoding let along I don't really have anything interesting for live broadcasting. If you are interested, please send me an email, maybe we can team up. Justin.tv was shut down on August 5, 2014. 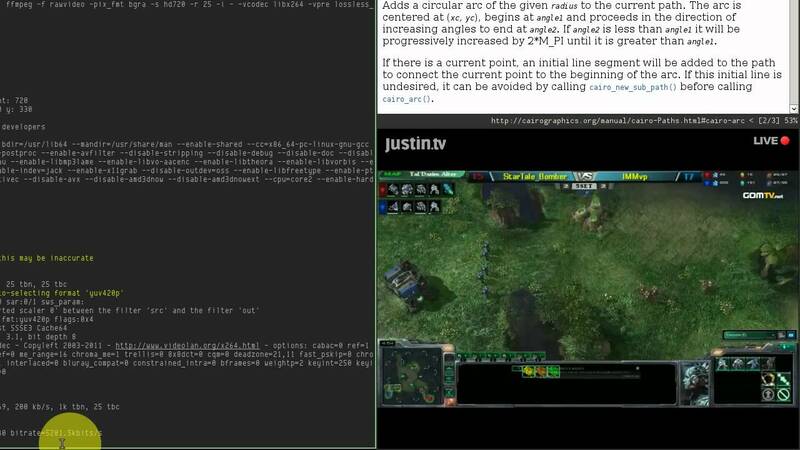 On Justin.tv you can grab the stream key in channel info page1, scroll down for Stream Key. Note that I have submitted two patches, once they get released you would have better control. Justin.tvs webchat is pretty buggy, at least it doesnt like me much. I have seen message being eaten up, I thought why the other person kept talking to self. Another issue was funny, I had to turn off (uncheck) in order to show timestamp. But it seems fixed, right now. When I start broadcasting, I fire up irssi and issue /connect jtvme to connect to my own IRC channel. If you dont have IRC client, currently stable Firefox allows you to open IRC via third-party website, its ehh, I forgot the name. Anyway, it has no problem to connect to JTVs IRC server. It took me sometime to Google correct information and pieced them up into my configuration. Streaming with music is always some vague issues. I love watching StarCraft II [SCII] channels and I have seen some complaints over some channels before, but right now it seems fine because those top-page popular channels play music via GrooveShark or YouTube. I dont know if its somewhat ignored by JTV. I dont believe those labels would let JTV off the hook. At first, I didnt even have audio stream sent to JTV. I found its boring, so I started to play those music I downloaded from Jamendo before. I still didnt give them proper attribution, though I have put a Last.fm recently played on channel page. [SCII] Nope, I dont play, I just watch. I use Linux. As for Ustream, you need to download the FME XML file, search for <stream>, the string inside is your STREAM_KEY. I dont like broadcasting on Ustream, because it requires you to click on Start Broadcasting on the website and you need to keep the Flash on. Which we Linux users all know, Flash has not-so-good performance. If you know how to bypass it, please leave a comment. However, it has nice beginner controls of your stream, I think you can put on overlay text by using it. And be careful for your stream key, ffmpeg might print out that URL, which would include your key. I think your can lower your log level, but I dont want to do that, read ffmpeg(1) if you need to. http://www.justin.tv/settings/channel/info/ is gone, because Justin.tv is gone. This is just a quick announcement about what I am currently doing. I started a new project last week, x11grabr, X11 video GRABbeR. 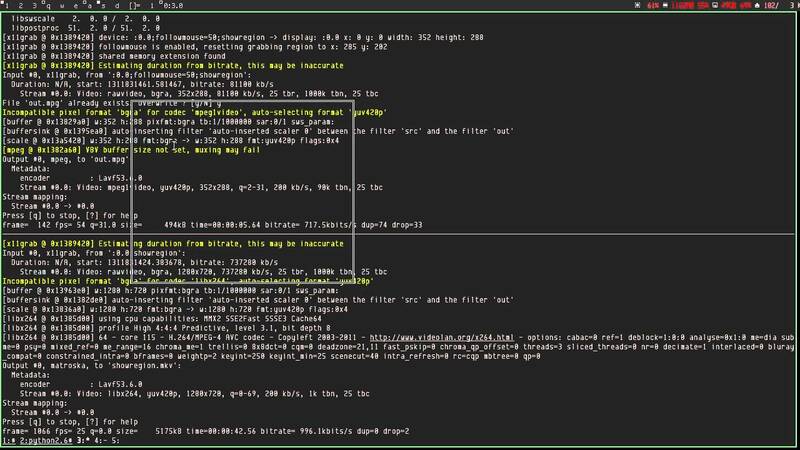 Its a fork of x11grab of libav/ffmpeg. It can do what x11grab does and a little more as you can see in the screencast about. It has issues, but they wont be fixed anytime soon. I list some tasks, go check up and give me some feedback and thoughts. Its not ready for production use yet. But it's not originally made from FFmpeg but libav. One day later after pushed to libav, my two patches got merged into FFmpeg. Never heard of libav? 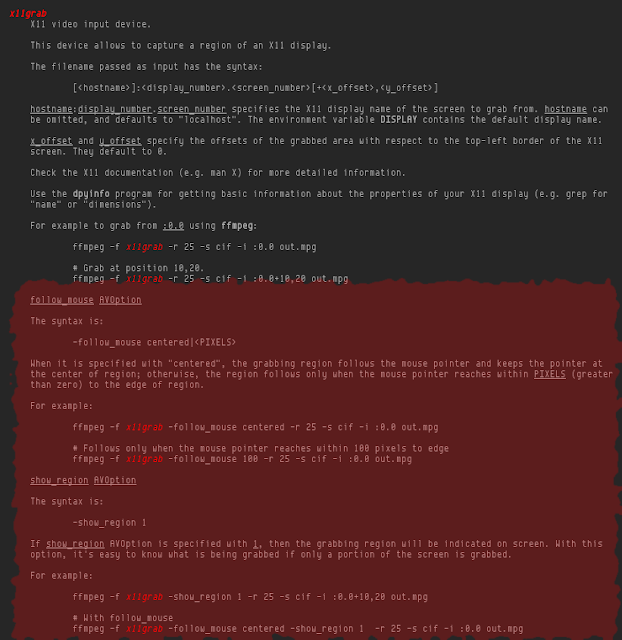 Neither did I before until I read this thread FFmpeg-devel, then I decided to submit on libav-devel. I got immediate response and many pointers about my code. I did wrote silly code, you can read my threads followmouse-1, followmouse-2, and showregion. to enable these two options. You can see a video about them, but I changed they style, it's now dashed line box, not the solid lines as you see in that video. Go grab FFmpeg or libav, if you can't wait.